For Clementine, spring is a really big deal. It's the time for seeing her apple tree start to grow, for watching her friend Margaret go crazy with spring cleaning, and for going on the school trip to Plimoth Plantation. Clementine is ready for Ye Olden Times, but she isn't so sure about surviving lunch there-the fourth graders have strict rules about no eating sounds. (What is snicking, anyway? ) If that wasn't enough, Clementine also faces the challenges of learning Olive-language and surviving The Cloud on Bus 7. Hearing the pilgrim lady talk about why she made the long journey from England makes Clementine think about rules. Who makes them, and what do they mean to the people who have to live with them? Today Clementine has to decide which rules are made to be broken. Sara Pennypacker (www.sarapennypacker.com) was a painter before becoming a writer, and has two absolutely fabulous children who are now grown. She has written several books, including Clementine, The Talented Clementine, Clementine's Letter, Clementine, Friend of the Week, and Clementine and the Family Meeting, all illustrated by Marla Frazee. She grew up in Massachusetts and lives there to this day. 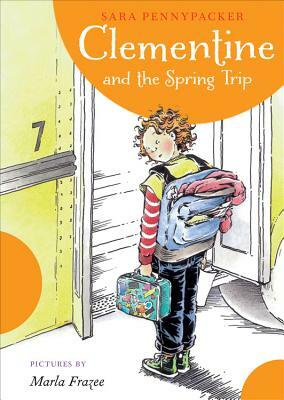 Marla Frazee (www.marlafrazee.com) illustrated the first five books in the Clementine series. She is the author/illustrator of The Boss Baby; Walk On! ; Santa Claus, the World's Number One Toy Expert; and Roller Coaster. She is also a two time Caldecott Honoree, for All the World by Liz Garton Scanlon, and her own A Couple of Boys Have the Best Week Ever . Marla works in a small backyard cabin under an avocado tree in Pasadena, California.